The principles of beat frequency or heterodyning oscillators were discovered by chance during the first decades of the twentieth century by radio engineers experimenting with radio vacuum tubes. Heterodyning effect is created by two high radio frequency sound waves of similar but varying frequency combining and creating a lower audible frequency, equal to the difference between the two radio frequencies (approximately 20 Hz to 20,000 Hz). the musical potential of the effect was noted by several engineers and designers including Maurice Martenot, Nikolay Obukhov, Armand Givelet and the Russian Cellist and electronic engineer, Leon (or Lev) Sergeivitch Termen . One problem with utilising the heterodyning effect (heterodyning is the effect where two high frequency signals are added producing a third audible tone which is the difference of the two high frequencies. This effect was the basis of many vacuum tube based electronic instruments.”) for musical purposes was that as the body came near the vacuum tubes the capacitance of the body caused variations in frequency. Leon Termen realised that rather than being a problem, body capacitance could be used as a control mechanism for an instrument and finally freeing the performer from the keyboard and fixed intonation. Termen’s first machine, built in the USSR in 1917 was christened the “Theremin” (after himself) or the “Aetherophone” (sound from the ‘ether’) and was the first instrument to exploit the heterodyning principle. The original Theremin used a foot pedal to control the volume and a switch mechanism to alter the pitch. This prototype evolved into a production model Theremin in 1920, this was a unique design, resembling a gramophone cabinet on 4 legs with a protruding metal antennae and a metal loop. The instrument was played by moving the hands around the metal loop for volume and around the antennae for pitch. The output was a monophonic continuous tone modulated by the performer. The timbre of the instrument was fixed and resembled a violin string sound. The sound was produced directly by the heterodyning combination of two radio-frequency oscillators: one operating at a fixed frequency of 170,000 Hz, the other with a variable frequency between 168,000 and 170,000 Hz. The frequency of the second oscillator being determined by the proximity of the musician’s hand to the pitch antenna. The difference of the fixed and variable radio frequencies results in an audible beat frequency between 0 and 2,000 Hz. The audible sound came from the oscillators, later models adding an amplifier and large triangular loudspeaker. This Theremin model was first shown to the public at the Moscow Industrial Fair in 1920 and was witnessed by Lenin who requested lessons on the instrument. Lenin later commissioned 600 models of the Theremin to be built and toured around the Soviet Union. 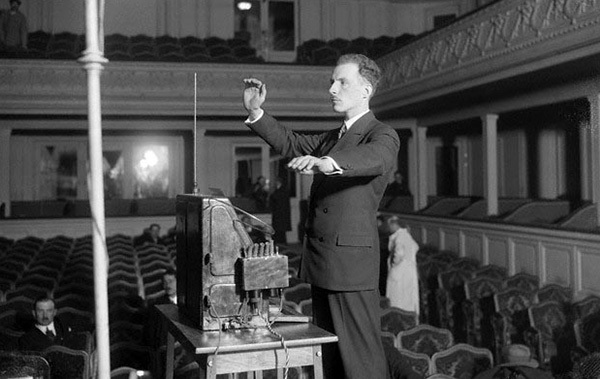 Termen left the Soviet Union in 1927 for the United States where he was granted a patent for the Theremin in 1928. The Theremin was marketed and distributed in the USA by RCA during the 1930’s as a DIY kit form or as a finished instrument ( later aficionados of the instrument included Robert Moog who made and sold transistorised Theremins in the 1950s). The heterodyning vacuum tube oscillator became the standard method of producing electronic sound until the advent of the transistor in the 1960’s and was widely used by electronic musical instrument designs of the period. The Theremin became known in the USA as a home ‘novelty instrument’ and featured in many film soundtracks of the 1940-50’s, it also appeared in several pop records of the 1960’s but never overcame it’s novelty appeal; used for effect rather than as a ‘serious instrument’, most recordings employ the Theremin as a substitute string instrument rather than exploiting the microtonal and pitch characteristics of the instrument. 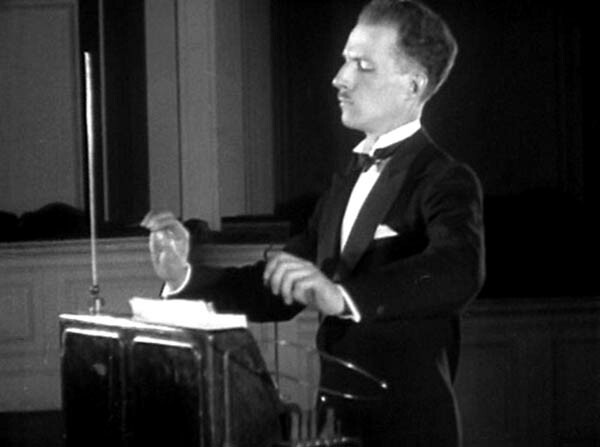 Leon Sergeivitch Termen went on to develop variations on the original Theremin which included the “Terpsitone“, The “Rhythmicon“, the “keyboard Theremin” and the “Electronic Cello”. The story of Lev Sergeivitch Termen is like some nightmarish John LeCarre novel. Prof. Termen was born in the Russian city of St Petersberg in 1896, he would become one of the most important pioneers in the development of electronic music through his instrument the Thereminvox (commonly referred to as the Theremin). Prof. Termen first invented a prototype Thereminvox in 1920, he worked upon his invention for the next few years, whilst also relocating from Russia to New York. A US patent was granted to Termen for the invention of the Thereminvox in 1928. Termen set up a studio there catering to high society patrons from whom he would extract the moneys he used to continue his experiments. His New York studio apparently was kitted out with a variety of devices, that in the late twenties must have seemed like pure science fiction: a variety of electronic audio devices; electronic lighting shows; an electronic dance platform; even a prototype colour television system. 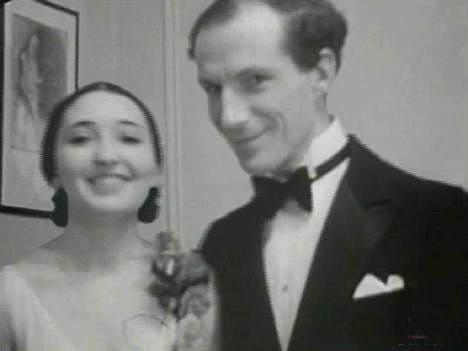 In 1938 Termen was rumoured to have been kidnapped in the New York apartment he shared with his American wife (the black ballet dancer, Iavana Williams) by the NKVD (forerunners of the KGB). Infact he returned to Russia for tax and financial problems in the USA as well as his concerns over the coming war. On his return He was accused of propagating anti-Soviet propaganda by Stalin. Meanwhile reports of his execution were widely circulated in the West. In fact Termen was not executed, but interned in Magadan, a notoriously brutal Siberian labour camp. Termen was put to work on top secret projects by the Soviet authorities (together with Andrei Tupolev, Sergei Korolev, and other well-known scientists and engineers) which culminated in his invention of the first “bug,” a sophisticated electronic eavesdropping device. Termen supervised the bugging of both the American embassy, (and perhaps, Stalin’s private apartment). For this ground-breaking work he was awarded the Stalin Prize (first Class), Russia very highest honour. After his rehabilitation Termen took up a teaching position at the Moscow conservatory of music. However he was ejected for continuing his researches in the field of electronic music. Post war Soviet ideology decreed that modern music was pernicious. Termen was reportedly told that electricity should be reserved for the execution of traitors. After this episode Termen took up a technical position, and worked upon non-music related electronics . Ironically his invention the Thereminvox, was becoming vastly influential in America, a development of which he was completely unaware.Before his death in 1993 Prof. Termen made one final visit to America lecturing, and demonstrating his Thereminvox. “PULLING MUSIC OUT OF THIN AIR: AN INTERVIEW WITH LEON THEREMIN”By Olivia Mattis and Robert Moog. February 1992 issue of Keyboard Magazine. ‘Sound in Z: Experiments in Sound and Electronic Music in Early 20th Century Russia’. 2013. by Andrey Smirnov. Second paragraph, directly below the picture of Lev Termen, there are a few HTML tooltip tags that didn’t quite get closing quotation marks. Thanks for the great collection of information. Congratulations on your monumental work. I am a little surprised that even though you have made liberal use of images from my award winning feature film, THEREMIN-An Electronic Odyssey, you have failed to mention it in your article. This includes being nominated for a BAFTA, for UK reference. Before my film came out the theremin was relegated to the role of anachronistic musical instruments and weird sound effects generator. Since then, Bob Moog began producing theremins again and now around the world there are thousands of talented musicians studying and playing the instrument. 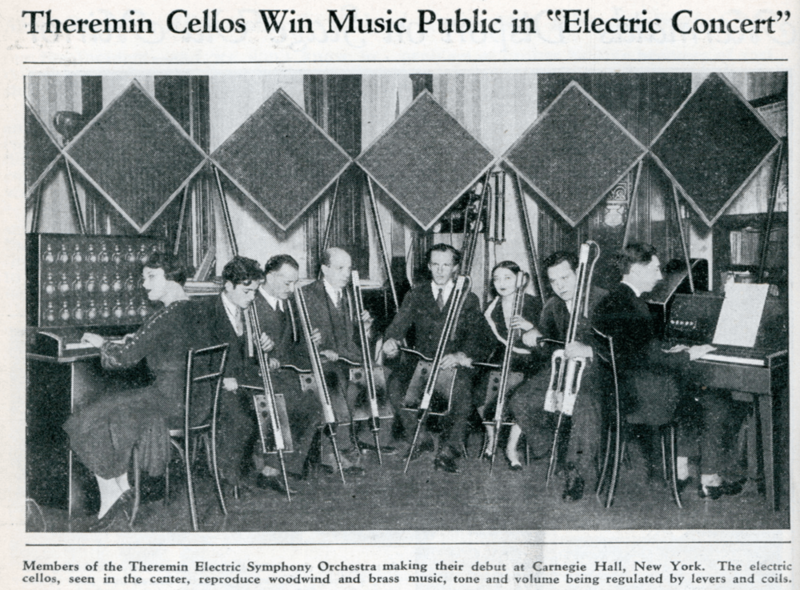 I brought Professor Theremin back to New York and spent quite a lot of time with him and his colleagues. 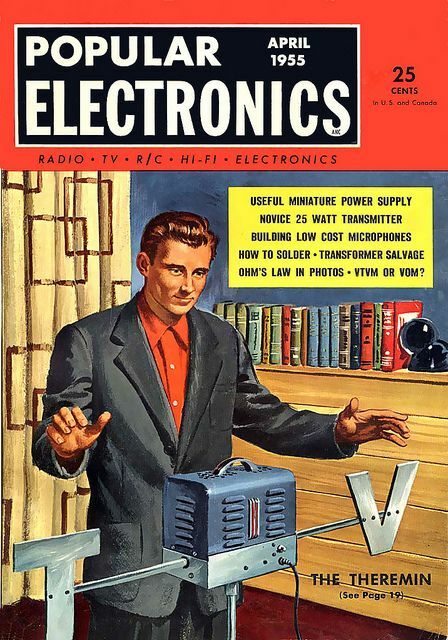 It is rather obvious that Professor Theremin’s story of leaving New York voluntarily was a cover story to make his life easier in the Soviet Union. Fascist armies were no where near Leningrad when he was forcibly returned to the Soviet Union. The war hadn’t even started. But Stalin’s great purges were underway. The books that claim otherwise were written by people who met Theremin briefly. Sure, he was having a tough time in Depression era Manhattan financially, so were millions of other people, especially those in creative and experimental fields. I spoke at length with his colleges at Joffe Institute in St. Petersberg who filled me in on more details of what happened when Theremin was ‘returned’ to Russia. This great man was subjected to terrible treatment from his return until the war started and he was, along with many others, moved out of the brutal prison camp at Magadan in Siberia to a Sharaska, or work laboratory, to contribute to the war effort. Watch my film and listen to what Professor Theremin says about it. The text says the production model came out in 1920, but the headline is 1922?